Kubu Bali is sculpted into the sides of a valley scooped out of the mountainside by the same volcanic cataclysm, which gave Bali to the world. The sights and sounds, the fragrance and harmony of Bali are all here. Each cottage has its own secluded terrace with views out over the landscape of colorful foliage to the contrasting blues of sea and sky and island beyond. There are twenty cottages - ten luxuries standard and ten deluxe suites, all with marble terraces and simple, elegant teak furniture. 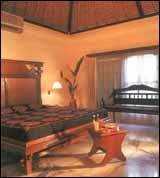 Air conditioning, fans and hot water offer additional comfort and the bathrooms are open to the sun and night skies. Two swimming pools in natural curving shapes are surfaced with thousands of tiny blue and green pebbles, one high up the terraced slope and the other at the bottom of the valley beside the main restaurant. Nature is all pervasive. The call of wild birds and monkeys echoes from the hills above. The music of water cascading through endless fishponds merges with the faint and restless sound of the surf far below. Breakfast and snacks are served from a tiny bar and restaurant at the upper swimming pool with views out over the sea to the island of Nusa Penida and Bali's distant southern coastline. Safety deposit boxes and Swimming pool. Drugstore, Massage, Badminton court, Trekking, Snorkeling, Sailing, Diving, Baby sitting service, Taxi service, Postal service, Laundry service and Doctor on call 24 hours.